The attack comes as Iraqi security forces are preparing for an operation to retake the militant-held northern city of Mosul, the country's second largest city, from the IS group. Attacks killed at least 46 people in Iraq on Saturday, including a suicide bombing claimed by the Islamic State group that was the deadliest to hit Baghdad in months. The violence comes as Iraqi forces prepare for an operation to retake Mosul, the last IS-held city in the country — a key battle, but one that will not end the threat of attacks such as those carried out on Saturday. In the deadliest attack, a suicide bomber targeted a funeral tent where mourners were gathered to pay their respects in the Shiite-majority Shaab area of north Baghdad, officials said. IS issued an online statement claiming the attack, saying it was carried out by a man who detonated an explosive vest. A witness said the bomber entered the funeral tent and blew himself up as lunch was being served. “I saw with my eyes 20 martyrs on the ground,” the witness said. Blood stained the ground at the scene of the attack, which was littered with the remains of plastics chairs mourners had been seated on. IS, a Sunni extremist group, considers Shiites to be heretics, and frequently carries out suicide bombings and other attacks against them in Baghdad and elsewhere in the country. Saturday’s bombing is the deadliest to hit the Iraqi capital since early July, when a suicide bombing in central Baghdad sparked infernos in a crowded shopping area, killing more than 300 people. 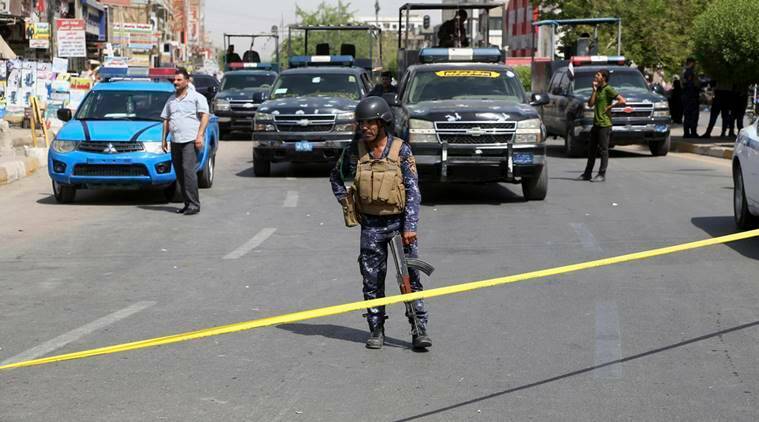 That attack led to a shakeup of senior Baghdad security officials and the announcement of other measures aimed at improving security in the capital, but the bombings have continued. Also on Saturday, militants attacked two areas north of Baghdad, killing a further 12 people, according to police. In Malha, an area east of the city of Tikrit, suicide bombers attacked a federal police position, killing eight and wounding 11, officers said. And in the Ishaqi area, two militants shot dead the wife and three children of the commander of local tribal forces before fleeing and blowing themselves up when they were cornered by Iraqi forces.